How Air Bags Work ? An airbag is a type of vehicle safety device and is an occupant restraint system. The airbag module is designed to inflate extremely rapidly then quickly deflate during a collision or impact with a surface or a rapid sudden deceleration. 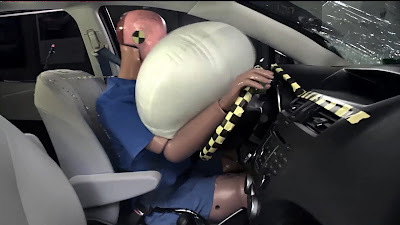 The purpose of the airbag is to provide the occupants a soft cushioning and restraint during a crash event to prevent any impact or impact-caused injuries between the flailing occupant and the interior of the vehicle. The airbag provides an energy absorbing surface between the vehicle's occupant and a steering wheel, instrumental panel, A-B-C- structural body frame pillars, headliner and windshield/windscreen. >The bag itself is made of a thin, nylon fabric, which is folded into the steering wheel or dashboard or, more recently, the seat or door. >The sensor is the device that tells the bag to inflate. Inflation happens when there is a collision force equal to running into a brick wall at 10 to 15 miles per hour (16 to 24 km per hour). A mechanical switch is flipped when there is a mass shift that closes an electrical contact, telling the sensors that a crash has occurred. The sensors receive information from an accelerometer built into a microchip. >The airbag's inflation system reacts sodium azide (NaN3) with potassium nitrate (KNO3) to produce nitrogen gas. Hot blasts of the nitrogen inflate the airbag. 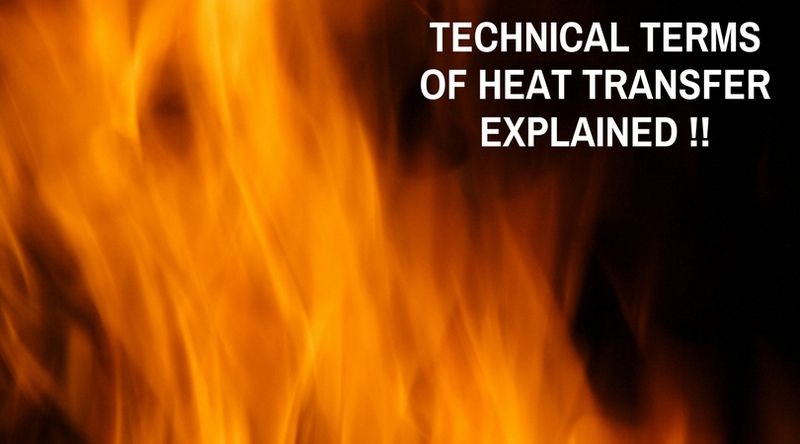 TECHNICAL TERMS OF HEAT TRANSFER EXPLAINED !! 1. )CELSIUS – The scale of changes of temperature which uses 0 degree as the freezing point and 100 degree as the boiling point for water at standard pressure. 2. )CHARLE’S LAW – At constant pressure, the volume of a gas is proportional to its absolute temperature. At constant volume, the pressure is proportional to its absolute temperature. 3. 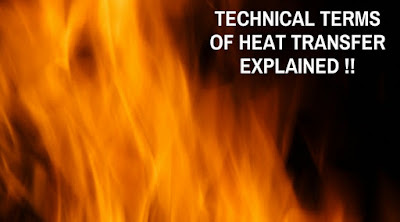 )CLOSED SYSTEM – The system which will have boundaries across which both heat and work can penetrate, but no mass will be permitted to cross them. 4. )Cp– Specific heat at constant pressure-Heat to be supplied to raise the temperature of 1 kg of gas through 1°C, the pressure being kept constant (in other words external work is done). 5. )Cv– Specific heat at constant volume-Heat to be supplied to raise the temperature of 1 kg of gas through 1°C, the volume being kept constant (in other words no external work is done). 6. )DALTON’S LAW OF PARTIAL PRESSURES – At a common temperature, a mixture of gases will exert on the sides of the vessel a total pressure equal to the sum of the pressures which each constituent would exert separately if it alone occupied the vessel. 7. )DRY SATURATED STEAM – Saturated steam, as generated from water, that contains no moisture in suspension. 8. )EQUIVALENT EVAPORATION – Amount of water in kg. that would be evaporated from water at 100°C into steam at 100°C and 1.03 kscm, by the heat put into steam actually evaporated in one hour by 1 kg of fuel. 9. )FACTOR OF EVAPORATION – A quantity which when multiplied by the amount of steam generated at a given pressure from water at a given temperature, gives the equivalent evaporation from and at 100°C. 10. )FLOW WORK – The product PV (pressure and specific volume) represents flow work in a steady flow system.